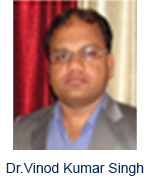 Dr. Vinod Kumar Singh is an Associate Professor/Head of Department in the Electrical Engineering Department of S. R. Group of Institutions at the University of U.P.T.U. Lucknow. He received his Ph.D. Degree in Electronics & Communication Engineering from B.U. Rajasthan University in 2013 then worked as Lecturer in I.E.T.Bundelkhand University as well as in S. R. I. Datia. Also He worked as an Associate Professor/Head in S. R. Group of Institutions, Jhansi for four Years. 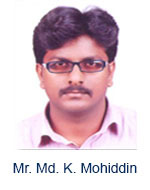 He is having about 12 Years of Experience in the field of Electrical/Electronics Engineering. His Area of Expertise includes: Dual and Tripple band Microstrip Antenna, Ultra wide band and Textile Antenna. He is the author of Book Chapter in Springer. 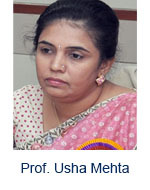 Prof. Usha Mehta has done her Ph. D. in the area “Testing of VLSI Design” and is currently working as Professor at Nirma University, Ahmedabad. She has more than 19 years of industrial and teaching experience. She has published one book and more than 48 research papers in international and national journals and conferences. She has been the reviewer of books for TataMcGraw Hill and many reputed journals. She is also active in Ph.D. and M. Tech. Guidance. She is having research projects with funding of more than 27 lacs from ISRO and GUJCOST. Currently she is the General Chair of 19th International Sympsium “VLSI Design and Test-2015” being organized at Nirma University, Ahmedabad. She has been conference chair and co-chair for international conference NUiCONE-2012 and NUiCONE-11 respectively. She is member of steering committee of many international conferences which includes NUiCONE-2012, NUiCONE-2011, VDAT-2013 and so on. She has been nominated for “CSI award for Best Research work”, “ISTE award for Best Women Teacher” and “ISTE award for Best Ph.D. thesis” from Institute of Technology, Nirma University. Assistant Professor, Department of Electrical Engineering, Indian Institute of Technology, Ropar, India. Associate Professor, Electronics and Communication Engineering Department, Delhi Technological University, India. Assistant Professor Department of Electronics & Communication Engineering, National Institute of Technology, Durgapur, West Bengal, India. Assistant Professor, Department of Electronics Engineering, Indian School of Mines Dhanbad, India. Associate Professor, Institute of Technology, Nirma University, India. Assistant Professor, Electronics Engineering Department, Tatyasaheb Kore Institute of Engineering & Technology, Warananagar. Professor, Electronics and Communication Engineering Department, National Institute of Technology, Trichirappalli.